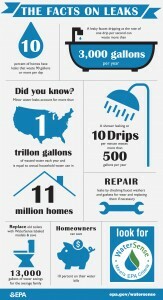 It’s once again time for the U.S. EPA and their WaterSense® partners’ annual Fix a Leak Week awareness initiative happening from March 14-20. A little detective work during this week can have big benefits through the rest of the year, and just like any good sleuth, it’s important to know the facts about what you’re tracking down and then the right tools to handle a problem. An average household’s leaks can account for more than 10,000 gallons of water wasted every year, equal to the amount of water needed to wash 270 loads of laundry. Common types of leaks found in the home (that are relatively easy to correct) include worn toilet flappers, dripping faucets, and other leaking valves. You don’t need a private eye license, a magnifying glass, or a trench coat to make the case during Fix a Leak Week. Every leak detected and repaired is another step forward in finding a solution to the 1 trillion gallons of water wasted per year, and restoring the health of our precious water resources.